In order to examine the evolution of the phalangeal formula in a diverse clade of turtles, including hyperphalangy as a rare condition in this group, we studied 210 specimens representing all extant genera of Trionychidae and their sister taxon, Carettochelyidae. Both groups consist of highly aquatic species with elongated autopods that are either paddle-like (Trionychidae) or transformed to flippers (Carettochelyidae). Phalangeal formulae were obtained mostly by radiographs of alcohol-preserved or dry specimens, as well as by direct counts from skeletons. All trionychids and Carettochelys are pentadactylous, but their phalangeal formulae differ. Carettochelys exhibits the turtle-plesiomorphic state (manus and pes: 2-3-3-3-3), with no variation in adults. Trionychids exhibit intraspecific variation, ranging from 2-3-3-3-2 to 2-3-3-6-5 for the manus, and from 2-3-3-3-2 to 2-3-3-5-3 for the pes. The extant Carettochelys as well as the Middle Eocene Allaeochelys crassesculpta are characterized by an elongation of phalanges, whereas trionychids consistently have shorter phalanges. All trionychid genera exhibit some degree of hyperphalangy in digits IV and V, in both the manus and pes. Phalanges of the clawed digits I–III are very robust compared to phalanges of the non-clawed digits IV and V. The latter contribute significantly to the enlargement of the paddle by their additional phalanges. We hypothesize that this phalangeal pattern is coupled with prolongation of growth processes in the non-clawed digits. The differences in autopod morphology between carettochelyids and trionychids reflect different locomotor patterns related to different natural histories (elongated flippers for high-speed escape in the mainly herbivorous Carettochelys; broad paddles for rapid turns during hunting in the mainly carnivorous trionychids). 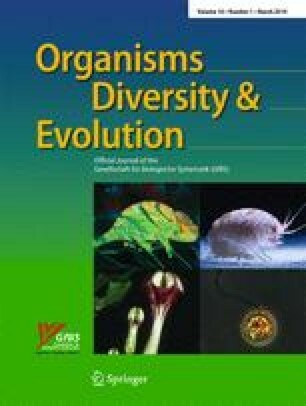 The autopod of Pelodiscus sinensis is proposed as an experimental model to examine the developmental basis of adult autopod variation. For access to collections, we thank Walter Etter (NHMB), Gunther Köhler (SMF), Patrick Campbell and Colin McCarthy (BMNH). Markus Auer (MTD) assisted with the X-raying of specimens in Dresden. Anna Bonardi kindly discussed some aspects of the data analysis and helped in the preparation of Figs. 4 and 6. Ingmar Werneburg supplied the silhouettes for Fig. 5. Christian Mitgutsch and Torsten Scheyer provided literature, suggestions, and comments on an earlier version of the manuscript. Two anonymous reviewers and Stefan Hertwig (Bern) made useful critical comments, and we are especially thankful to Olaf Bininda-Emonds for several useful suggestions besides editorial work. This study was supported by the Fonds zur Förderung des akademischen Nachwuchses (FAN) des Zürcher Universitätsvereins (ZUNIV). Bininda-Emonds, O. R. P., Jeffery, J. E., Sánchez-Villagra, M. R., Hanken, J., Colbert, M., Pieau, C., et al. (2007). Fore limb-hind limb developmental timing across tetrapods. BMC Evolutionary Biology, 7/182. doi: 10.1186/1471-2148-7-182.